Marvel Civil War: Who side are you on? Side A: Heroes are dangerous weapons, they should be registered and controlled. The work as members of S.H.E.I.L.D. We know who they are, what they are and how they can be controlled. It's a matter of public security. Heroes are private citizens who deserve freedom. They keep there identies secret to protect there families and friends. They are not for hire. Why does the government need to know! Which side do you choose? Me...I'm siding with B, Capt'n America's side. And you? Here's some pics from the series so far....there's going to be one hellva mess to clean up when it done, from what I've just read so far. There has been deaths of heroes on both sides. The song "Heroes" by the wallflowers was going through my mind well reading the series so far! [spoiler] During a televised raid of a house containing select villains that had recently escaped from the super villain facility at Ryker's Island prison during a massive breakout, the escaped villain Nitro let off a massive explosion that killed the majority of the New Warriors, as well as the children at a nearby elementary school. In the wake of the tragedy, the U.S. Government proposed the Superhuman Registration Act, intending to register all super-powered beings as living weapons of mass destruction and requiring all costumed heroes to unmask themselves before the government and subject themselves to federally mandated standards. This event triggered negative public opinion against the super-heroes, resulting in the assault of Human Torch (Johnny Storm) by a mob and the request by S.H.I.E.L.D. for Captain America (Steve Rogers) to become part of the enforcement of super heroes to register. When Cap refused, S.H.I.E.L.D. Director Maria Hill ordered S.H.I.E.L.D. 's Anti-Superhuman Response Unit to tranquilize him, but Rogers escaped and went underground. When the super-heroes met to discuss the best course of action, Uatu the Watcher appeared. As Watchers only appear to monitor key events throughout history, it was noted that his presence did not bode well for the heroes. In a secret meeting with the President, Iron Man suggested that the President proceed and push the registration act while he, Mr. Fantastic, and Yellowjacket vowed to bring Captain America to the ground. The Superhero Registration Act became law, and S.H.I.E.L.D. captured the Young Avengers. But little did they know that Captain America and the Falcon were undercover and rescued the Young Avengers, who joined their rescuers in the Resistance. At a press conference in Washington D.C., Iron Man gave a speech introducing Spider-Man to the podium. Spider-Man then talked about how over the past years, he had kept his identity a secret, then talked about the registration act and how it gives superheroes a choice... to continue the trend Captain America advocates and have people with powers completely unchecked, or that superheroes can go legitimate and earn back a little public interest. To demonstrate his support of the Act, Spider-Man unmasked himself and revealed to the world that he is Peter Parker. Iron Man traveled to the X-Men Mansion, asking Emma Frost if the X-Men would sign the registration act and join his side. Miss Frost explained to Stark that the X-Men would not sign the registration act because they believe that hunting down registration rebels would be against everything the X-Men stand for, explaining that they know what it's like to fight the good fight while being persecuted. Frost says that as long as the pro-registration side leaves the X-Men alone, they will not join Captain America's side either. While Stark left the mansion, he was approached by Bishop, who asked for a word with Iron Man. how about, whatever? hehe. i bought a couple of issues of the new green lantern book, but after reading them, i realised i wouldn't be doing anything else - including reading them - ever again. so i quit and gave the books to our neighbours. that said, i've kept my 1 hellboy and 6 transmet comix. the transmet ones at least seem to be more story-based and engaging on realistic levels than normal comix. iunno, i can't explain it. for me, heros don't seem to do it for me anymore. it's odd - i used to collect the comix a little bit and could tell you what was what. not sure when/how/why i got outta them, but i seem to have. my neighbour, a 6 year old kid, loves them tho! Mat....you know me. You know my secret Identity. I think that's why no matter how hard I try to give them up....I still comeback to them months later. I can relate to having to be two ppl. Show ppl one side of you well hiding the other! I can relate to spiderman and batman....having to protect the ones I love. crazy huh. but true. Civil War hits home for me cause it's covering anything and everything. It could be the war in the gulf or the war on drugs or my personal war I find myself fighting everyday. I know it's over the top....that's why I like it....it's an escape trip! For just the one hour I spend reading a comic book, I can forget about my problems and stuff. I don't think you like them cause you got alot of good things going for you. There's nothing for you to relate too. Reading the issue were spiderman tells the world that he's peter parker really hit home for me....I was stunned. I can tell you more later why in google talk. bottomline comics at the best and basic value are suppose to be fun. That's why I still stick with them....even though I just stand and read them at the newstands or comic shops! For months, Marvel has been asking "Whose side are you on?" Well, now it's decision time. Marvel has released two Civil War banners that can be posted on your website, in your message board signature, or on your Myspace page. Choose your side in Civil War and prominently display your choice with either a Captain America Anti-Super Hero Registration banner or an Iron Man Pro-Registration banner. The battle lines have been draw and it's time to take a side. Show your Civil War pride with either a "I'm with Captain America" or "I'm with Iron Man" banner. Has the series started yet? I think it started a couple months back. Greg sent me a checklist by e-mail that lists all 74 issues involved, being the main ones and the crossovers. I think it goes for the rest of the year. Yes it has started. 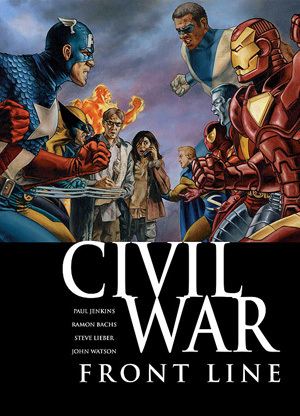 The Main storyline is called Civil War and there up to book 3 of 7. Read the spoiler section for the full details so far! The story is really good! Using certain programs I was able to find the issues that have come out so far and I have to say I'm impressed! The artwork is amazing and the storyline is, well the best I've read from marvel in along time! I am going to buy it when they release a Trade paperback version, cause I don't have the room to store 74 comics that relate to one issue! Everyone is involved in this storyline! If fact they resurrected Moon Knight too! (see my avatar) I love Moon Knight!! he's basically a marvel clone of batman! The punisher is back too....well back in the marvel main universe. Seems that SHEILD will be hiring Frank to take down renegade super heroes. There's just one question I have......with all the super-heroes fighting each other and stuff. Were or what are the villains up too? I know Doctor Doom is back cause they've showed hints that he up to something and the rumours flying around Marvel.com is that some Major hero is going to die. A watcher is also present and is watching the fight that breaks out in Issue 3 of Civil War. Plus there's alot of stress going on Peter Parker. All his villians know who he is now since he outted himself on national tv. They have a wallpaper background to civil war #5 where he's getting the crap beat out of him by Green Goblin, Venom, Bullseye. At the San Diego Comic Con this past weekend, director/actor/writer Jon Favreau, who is set to helm the highly anticipated big screen adaptation of Iron Man, announced who Shellhead's nemesis would be in the upcoming film. Mr. Favreau of Swingers and Made fame, named fan-favorite and long-standing Iron Man archenemy Mandarin as the villain who will be the rust in Tony Stark's armor. I think you (Greg) should post the checklist here and I should get to the comix shop. It's PDF and really large. If you want me to e-mail it to you, send me a PM with your address. taken care of Sean! just sent him the list and a bonus file....I hope Scobeto that you can uncompress .RAR files..if not let me know and I'll tell you were to get a program to do it for you! Enjoy it. If it works....let me know what you think of Spierman's new costume! Ben, I went to the local bookstore and picked up "A Contract with God Trilogy" last weekend. It's a really nice hardcover edition that Will Eisner was involved in and even did some extra artwork for. Haven't finished it yet but I am really enjoying. Thanks for the recommendation. My wife got to meet Will Eisner up at Ohio State University a year before he died. Wish I was there. Ben, I bought 'Blankets' about three weeks ago but haven't read it yet. I do like autobiographical and semi-autobiographical stuff. I like Joe Matt and Chester Brown's work, which definitely wouldn't appeal to the general public. 'Blankets' looks more accessible but still up my alley. Sean, check out your public library. My wife has developed a substantial graphic novel and manga collection at ours, with a healthy amount of independent stuff. She corresponds with many other librarians that are doing the same, there could be more at your local branch than you think. That must of been very cool to meet him. I'll check my library this weekend but I'm not very hopeful. Ours are pretty poor for these kinds of things. All they have are educational books. Besides I think I owe a small fortune from when I was in high school and I also take pride in my collection of graphic novels. It's like Mel Gibson and Catcher in The Rye in Conspiracy Theory. I have to have them. Marvel Zombies is a continuation of the Ultimate Fantastic Four arc by Mark Millar and Greg Land, where the Ultimate Reed Richards was tricked into using a teleporter, transporting him into the universe inhabited by the zombies, who had run out of food. Reed is saved by Magneto, one of the few remaining survivors, who explains that the infection started only a few days ago after an infected superhero (the Sentry) from yet another dimension, crashed into New York City looking for more food. Magneto is able to use the teleporter to send Reed and the other few survivors back into Reed's dimension. Magneto chooses to stay behind and sacrifice himself by destroying the teleporter, making sure that the zombies won't invade and infect other realities (it is implied that, up to that point, the zombie outbreak had been spreading through universe after universe in a seemingly endless cycle). The miniseries starts with Magneto surviving the explosion, but seemingly being the only non-infected person around. Colonel America (never a Captain in this universe) attempts to throw his metal shield at Magneto. However, this attack is easily deflected back and subsequently slices off a portion of the Colonel's head. Unaffected by this, the zombies continue their pursuit and eventually catch and eat Magneto. It is revealed that there are 12 other survivors (the Acolytes) on Asteroid M. Based on dialogue in issue #2, there may be human survivors out west. Hank Pym (Giant-Man) has been using T'Challa (Black Panther) as a sort of larder, keeping him in a containment tank heavily drugged. The Infected have eaten everyone on the planet (that they can find, anyway) and are all afraid of eventually going hungry, so Hank was "rationing out" the still-human Black Panther by cutting off pieces of him to maintain a fallback food supply (already having cut off his right arm and half of his right leg). The Silver Surfer (as the herald of Galactus) arrives on Earth and promptly informs the zombified heroes that Galactus is on his way to devour this planet. The zombies engage in combat with the Silver Surfer, eventually overpowering him and subsequently devouring him. As a result of this, the heroes discover that eating the Surfer grants them each a small amount of the Power Cosmic, enabling them to fly, among other abilities. The Marvel Zombies. Art by Sean Phillips. The Black Panther escapes along with the Wasp's severed, yet still alive head (that Hank Pym had bitten off and spit out in a prior argument) and meets up with the Acolytes, who were looking for Magneto. After having defeated them with the Wasp's unwilling help, he is met by the mutant Forge, who believes he survived the plague and can construct prosthetic limbs for the Black Panther. Shortly hereafter, Galactus arrives on Earth and announces that he will devour it. The zombies attempt to conquer Galactus as well, but quickly learn that, even with the Power Cosmic, they are no match for Galactus, after which they retreat. Hank Pym, Tony Stark and Bruce Banner begin creating a device which will hopefully overcome Galactus and grant them more "food", while the rest of the zombies bide their time. They also make the discovery that they can re-eat bits of what they have already eaten, which helps fight off the hunger (making the process of thinking intelligently easier). Upon completing the device, they return to Galactus wielding it, only to notice that several zombified villains (mainly Spider-Man villains) are incessantly attacking Galactus, who appears to be somewhat weakened. Using the device to amplify the powers they gained from the Silver Surfer, they blast a ray at Galactus, critically injuring him. A battle ensues as the heroes and villains fight over the fallen Galactus. The only survivors are Spider-Man, the Hulk, Iron Man, Luke Cage, Giant-Man (Hank Pym) and Wolverine. Colonel America was "killed" when the zombified Red Skull ripped the remainder of his brains out. Together, they attack the weakened Galactus and consume him. Cover to Ultimate Fantastic Four #30, featuring the Fantastic Four zombies and Ultimate Doctor Doom. Art by Greg Land. The story then skips ahead five years when the group aboard Asteroid M set foot on Earth again to discover it covered in plantlife and devoid of the living or undead. When contemplating what happened to the zombified superheroes, it is shown that they left with the cosmic power they gained from eating Galactus. The story ends with the remaining Marvel Zombies descending upon an alien planet as the new Galactus. So that's why Bryan ditched us last night? Nice.